In our house the Ma’ always had a special drawer where she kept all of her odds and ends. Sometimes she’d call it her ‘Button Drawer’ because that’s where she kept a round tin box full of old and used buttons. I think it may have been an old sweet box or something. Any garment or shirt that the family no longer wanted to wear was stripped of all its buttons and they were placed in the Ma’s button box. There was always plenty of old shirt buttons, blue and pink buttons from my sister’s cardigans, black ones that might come in handy for a funeral or great big brown buttons from someones top coat. There was even a few old F.C.A. buttons to be found in it. My mother would also keep old zips in the drawer that she would have rescued from an old dress or courdery jacket that was put in the back porch for the dog to sleep on. This drawer was a treasure trove of shiney bits and pieces. You could even find pieces of old thread, odd bits of wool, a nappy pin and sewing needles of all sizes in there. But most of all the Ma’ stored all of her coupons in this drawer for safe keeping. 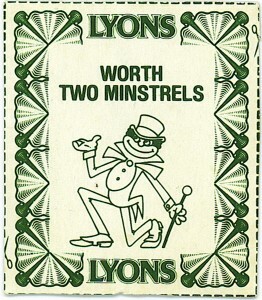 There was the Lyons Tea Minstrels coupons that she was supposed to send in with an application form for a free draw. The Kellogs Cornflakes coupons got a special place at the front of the drawer because they could be exchanged for a set of cutlery. For quite a while all the blue rent receipts were kept in this drawer too until they started to take over so they had to be housed in a box that she kept under the stairs in the coal hole. This was the box that housed all the insurance policies. The Ma’s button drawer had a strange smell of old things and odd things, things that didn’t belong anywhere else. Sometimes you might find an old rusty screw or a bent nail that might come in handy some day. No matter what it was you were looking for the Ma’ would always send you off to the button drawer first because if it wasn’t there it wasn’t anywhere. Sometimes of a winters evening if we were bored or just fed up we’d take out the button drawer and empty it out onto the kitchen table and sort everything out into little bundles or groups. I remember one time the Da’ took a few buttons out of the tin box and set up a game of push penny or push button. He let us use his good comb that he kept in his Sunday suit and the comb that he kept in his back pocket for work to push the buttons with. It was like a game of table football for two players. I suppose in a way the Ma’s button drawer was a magic sort of drawer. Well now, she’s gone and the Da’s gone and all the buttons and things from her button drawer are gone. They’re all gone to Button Drawer Heaven.